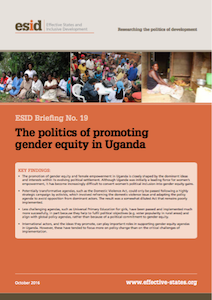 The framework used in this study brings together a political settlement approach and recent feminist analysis of women’s political empowerment in Uganda. In order to explore how the general configuration of power establishes the key incentives and ideas that shape the ways in which institutions work to deliver gender-inclusive development, this framework has been applied to two policy cases: the Domestic Violence Act (DVA) and Universal Primary Education (UPE). Through an analysis of the politics of each case, the paper tests the logic that one would expect transformative policy agendas to encounter stronger forms of resistance from dominant interests and ideas within a given political settlement than more ameliorative approaches.